You probably have noticed that I was busy porting Bloo Kid 2 to more target platforms. I was also experimenting with some other things like Amazon Underground, but this will follow in a (soon to come) blogpost. Today I want to focus on presenting you a complete revenue breakdown of Bloo Kid 2 on all platforms where the game is available at the moment. Since there are still more platforms to port the game to, I will update this post as soon as there is enough information available for more insight on the sales. For the sake of completeness, here is a very short summary about the game. 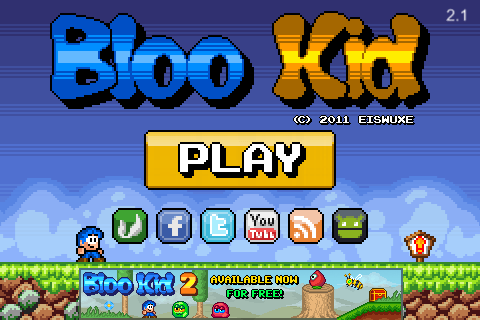 Bloo Kid 2 is a retro-style platformer that was developed with the Monkey-X cross-platform programming language. It was first released for mobile devices and later ported to a number of different platforms. Please understand that some platform holders do not allow to make sales numbers or other sensitive data public, so I must spare some details. But I bet you can always do the maths to see the whole picture. The iOS version is free with ads. I use Vungle video ads between the levels for monetization. Users can remove the apps via in app purchase ($1.99). This is also the version that took the most time to complete, because it was basically the “full game”. I worked on it for about a year. I was clever enough to utilize a trackable link for the click using geniuslink (former GeoRiot), but I was also dumb enough to use this exact link in many other places, so I cannot for sure say how many people really clicked the link from within the game. I then wrote to many review-sites and posted in basically all forums I could find that involve mobile games. The game was then reviewed by toucharcade and there was another news report after the game was updated with new levels. It was also featured in the “top 10 games of 2014” list from one of the touch arcade writers. The game has 143k downloads in total. Starting with a strong 4k downloads on release, the downloads dropped to 200-400 a day after one month. The small bump at the end of 2014 appeared when I released a content update. Now, nearly two years later, the game still sees 50-100 downloads a day. The Android version was developed simultaneously with the iOs version as a cross-platform game. The only real difference between the two was that I integrated GameCenter on iOS and Google Play Game Services on Android. And that I needed extra code for OS-specific Game Controllers. I basically did the same things as with the iOS version, like the banner-ad and writing in forums. The game has 167.207 downloads in total. During the first 1,5 years, the downloads were poor in comparison to the iOS version, with about 100 downloads a day. At the end of June 2015, downloads suddenly increased dramatically to 500-1000 a day, and I have no explanation for that. The update prior to this event was in January 2015, so it has nothing to do with it. The game must have been featured somewhere without me noticing it. The Android In App Purchases are far more worse than the iOS ones, with only 116 people removing the ads, generating only €167,09 in revenue during the 580 days lifespan. Vungle Video Ads brought in $1.628,62. Again a lot less than the iOS version. However, with the increasing downloads, the ad revenue increased as well. So things might get better in the future. The 3DS version was a rough ride. I was super happy when we were accepted as a developer for Nintendo platforms (dream come true!) so I ordered the dev-hardware and got my hands dirty at once. The Monkey-X framework cannot target the 3DS hardware, so I had to create an own 3DS target build. I also had to rearrange resource-loading and add more UI-screens for the 3DS’ second display as well as change a lot of stuff for the stereoscopic 3D-effect. I got major help from my former colleague Florian Eisele, who will be working closely with me on future projects. He did all the hardware-related coding so that I could focus on adopting the game to the new display and input possibilities of the 3DS. We had a version running within days, but it took us many additional weeks to iron out every problem like running out of video RAM or occasional framerate drops. In the end, it totally paid off. We now have a Nintendo 3DS title in our portfolio! And the game sold well enough to cover all our costs. We were negotiating with Nintendo and managed to get the game featured for two weeks in the Nintendo eShop in Europe. It was only featured in germany, so we don’t know how high the initial sales would have been if it was featured in more countries, but we were still satisfied. Nintendo also does a great job in writing press releases to inform the world about new releases on their platforms. So we did not need to contact people, but writers from blogs and websites asked us instead if they could get a download code so they can review the game. We sent out a bunch of review codes and were rewarded with a solid amount of reviews. The game is priced at €3.99 in Europe and $3.99 in the US respectively. A japanese version has been released lately, but I don’t have sales data yet. Releasing in Japan requires you to have a japanese office and bank account, which is why we partnered with Teyon to bring BK2 to Japan. The 3DS development did cost us a few thousand dollars for the dev-hardware and age ratings, but we still made (and are making) profit with this version. Plus, we now already own the hardware so that upcoming titles can be brought to the 3DS as well. It was our plan from the very beginning that we would port the game to all possible devices, especially those running versions of android, since the effort is incredibly small. After poor downloads on Amazon for Bloo Kid 1, the “relative” success of the Amazon BK2 version took us by surprise. Especially since we decided to release this version as a $3.99 premium download. We optimized the game for the amazon fire TV, added Amazon Game Circle, and even made the game playable with the normal Fire TV remote, so that you don’t necessarily need a game controller. We “borrowed” one trick from Nintendo for this though. Remember rotating the Wii-Mote by 90° in order to hold it like a game controller for playing Virtual Console games? There you go. This way, the game plays naturally with the Fire TV remote. One key-element for the success was a featuring on amazon.com. Even though the game was “only” featured in the Fire TV section, we got some nice sales. The game was among the top-rated and most popular games on Amazon for several days. 2.429 sales brought in $8.137 so far. But the game still has 5-10 sales a day. We are planning to release an Amazon Underground version soon, since judging from the Game Circle data, players are enjoying the game a lot and play it for several hours. We sent free keys to review sites and a lot of YouTubers, often on request. The YouTubers sometimes had several hundred-thousand subscriptions to their channel, so we were quite euphoric. In the end, nearly none of them made a video about the game. The only people doing a video were the very small channels with a handful of viewers. We were also participating in a steam bundle sales from indiegala. The game was on sale together with some other steam games for one week. Customers paid a minimum price, but could pay more if they wanted. One part of the revenue goes to charity, one stays with indiegala, and the rest is split up between the developers. The bundle lasted for one week and brought us $469. Much more than the game would have made on steam during that period. 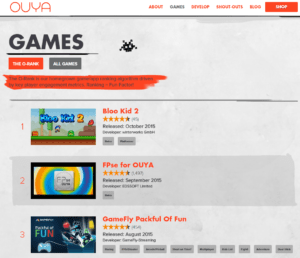 Ouya was a bit of a letdown to us. The console did not perform great in the past, but there are still new games released everyday, and some titles performed quite well on the platform. We decided to follow the recommendation from the Ouya team to make the game available for free and charge for unlocking all the content. The complete first world can be tested before users are asked for a one-time $3.99 purchase. The game stayed on top for several days. It currently resides at rank 11 with 170 ratings (4.5 / 5). Despite the pole position in the ranking, the downloads were very poor. Things are changing to what might be a brighter future, though. 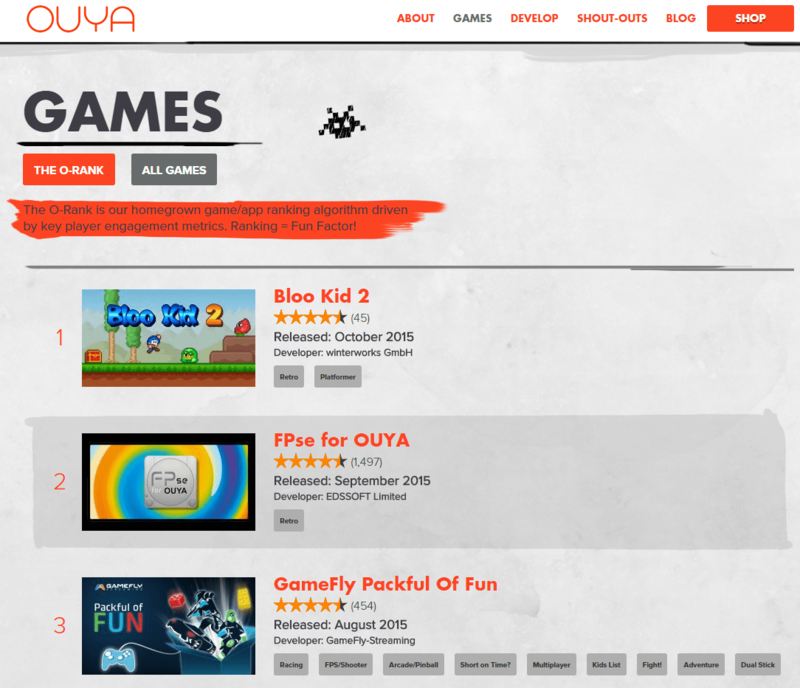 The Ouya Store will be made available for several other android microconsoles as stated earlier this year. But given the quite low hardware specs of the Ouya, it might be better to target those microconsoles directly and spare the Ouya in the future. We’ll see. Flare Play is a new (android) microconsole developed by the company behind the GameStick and distributed by Cox Communications. Users choose to pay a monthly fee in order to get different categories of content for free. The revenue is then divided among the developers relative to how long their games were played. It’s nothing new, but it is still a bit “unconventional” so to say. While I do not have revenue information yet, I can already say that we were paid for porting the game. While the fee was not that much, it was still profitable to us since the console is based on android and hence the time spent for the port was minimal. In total, Bloo Kid 2 generated $44.278 net-revenue across all current platforms. Given the fact that it took me one year to create the game and several more months to port it, this is a bit disappointing. Bloo Kid 1 created about three times the total revenue, but that was over the course of four years. So it will be interesting to see how Bloo Kid 2 will perform in the future. 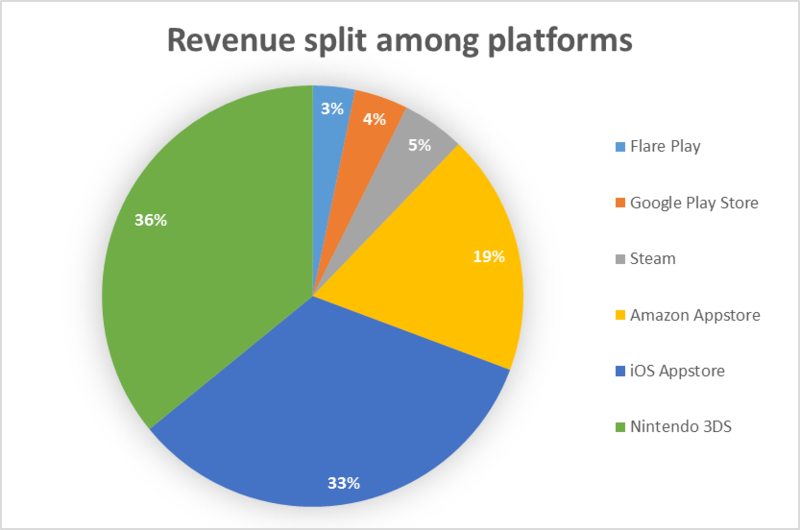 It is also interesting to see how the revenue is split up between the platforms. At first it seems a bit surprising that the main revenue comes from the Nintendo 3DS. But if you compare Bloo Kid 2 to Bloo Kid 1, you can see that part two is much more a “console”-type of game instead of a mobile game. Part one had non-scrolling, one minute sized levels. Bloo Kid 2 is the opposite and demands much longer gaming sessions. It is therefore less suited for mobile devices. Our conclusion would be that it totally makes sense to continue porting the game to real consoles, and this also fits into our general strategy to focus on traditional games in the future. That’s it for now. My Amazon Underground report will follow in a few weeks. As always, feel free to ask me anyhting in the comments below. And please share this post with all of your indie-dev buddies. Cheers! vielen Dank für diese Blog-Beitrag. Da ich gerade selbst am Entwickeln und Veröffentlichen bin, waren diese Informationen doch sehr! interessant und hilfreich. freut mich, dass Dir die Infos weiterhelfen. An was genau arbeitest Du denn? Mannheim ist hier gerade um die Ecke, vielleicht können wir uns mal ein bisschen austauschen. 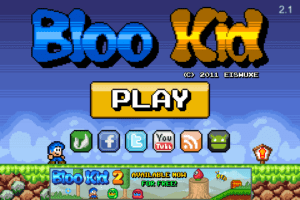 I would totally buy a Bloo Kid 1 on the 3DS! Are you considering porting 2 to ps3/vita or xbox? Something about it just goes so well being on a home console! It would be a breath of fresh air seeing a great indie platformer in the sea of mediocre PSN games! We will keep you updated on the topic! Is there a reason for not porting to Vita? We would love to do many more ports, but have to make one at a time. I myself think the Vita is a heavily underrated console, and we would love to make a vita port soon. I will keep you updated! That makes sense, you can only work so fast. And I agree, Vita is underrated. I will keep an eye out for your future Vita releases! Why are you still using Vungle as ad provider? Try new mediation providers – appodeal or so on. I must admit that I did not do a lot of “research” in advertising lately. Things have surely changed big. But when I started with the game in 2013, Vungle was still a good choice. I will surely have a look at app mediation services for the upcoming mobile games. Thanks for the reminder!